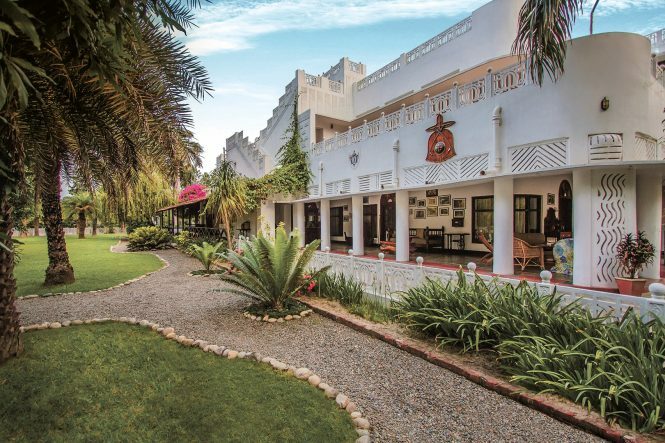 The main facade of Jaagir Lodge. Getting to Jaagir Lodge is no easy task: our flight to Lucknow, the state capital of Uttar Pradesh, is followed by a five-hour drive through mustard fields and dusty villages. But the rewards for venturing here are numerous. 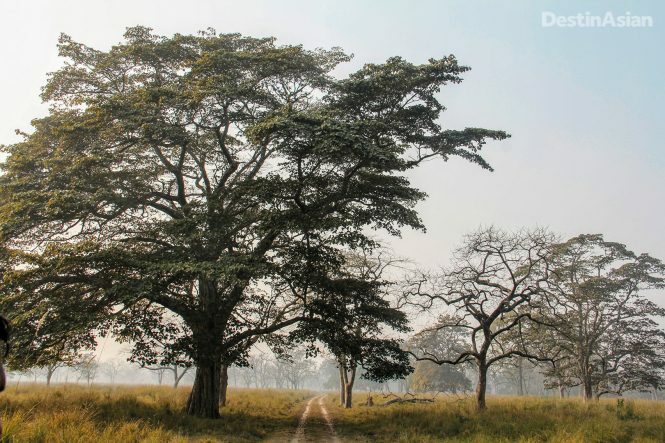 On the doorstep of three protected areas—Dudhwa National Park, Kishanpur Wildlife Sanctuary, and Katarniaghat Wildlife Sanctuary—near the India-Nepal border, the lodge lies in the Terai, the marshy lowlands between the Himalayas and the great plains of India. It’s a region rich in wildlife and tribal culture, and Jaagir Lodge’s recent takeover by Indian glamping specialists The Ultimate Travelling Camp (TUTC) means we have the perfect base for exploring it all. The folks behind TUTC are best known for their seasonal tented camps in remote corners of Ladakh and Nagaland. Jaagir is the first permanent property they manage. Built in the 1940s as a British plantation estate and hunting lodge, it was converted into a boutique heritage hotel a few years back under the Tree of Life group, with seven rooms and suites done up in period furnishings and vintage wallpapers. Now under TUTC, it’s been spruced up and retooled—think personal butlers, exquisite meals, stylish bath accessories, and curated excursions. The Wi-Fi is shaky and there are no TVs, but you hardly need them in a place like this. I’m particularly impressed by the dedication of the in-house naturalists. On our first safari in Kishanpur, about an hour’s drive from the lodge, my husband and I catch sight of a tawny tigress just meters from our jeep. She marks her territory, rubbing against a tall sal tree and spraying it with urine before sauntering off. Our guides Yogesh Ganu and Amith Bangre click away furiously on their cameras to capture the moment. “This is our lucky day!” they exclaim. The lodge’s proximity to Kishanpur and the other protected areas means we don’t have to travel far between game drives for a gourmet meal. Produce plucked from the chef’s organic garden appears in salads and hearty regional Indian fare, best enjoyed through a series of special dining experiences. One night we cap off a candlelit dinner with gil-e-firdaus, a delicious Hyderabadi dessert made from bottle gourd, condensed milk, and cashew paste. Another evening, there’s a poolside barbecue, complete with a crackling bonfire. And mornings begin with breakfast atop a rustic bamboo machan, a treetop platform once used for hunting tigers. It’s not just tigers that roam the wilderness here. An elephant safari at Dudhwa National Park yields the sight of a one-horned rhino mother and her calf ambling through the tall grass, a legacy of the species’ successful reintroduction in 1984. Then, at Katarniaghat Wildlife Sanctuary, a motorboat ride brings us within view of endangered gharials—crocodile-like reptiles with long, thin jaws and bulbous snouts—sunning themselves on sandbars in the middle of the Girwa River. 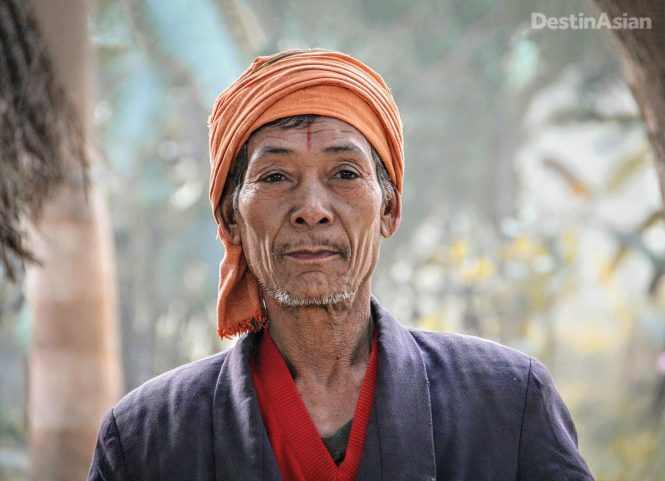 We also visit a village of Tharu people, a forest-dwelling tribe known for their folk arts, craftsmanship, and hunting skills. But our favorite part of the trip unfolds at Jaagir Lodge itself, where evenings are spent discussing the day’s sightings with our naturalists and fellow guests in the lounge. Over canapés and wine, we listen to stories of stalking leopards, sloth bears, and rare jungle cats. Who needs TV when you can see all these wonders for yourself? This article originally appeared in the April/May 2018 print issue of DestinAsian magazine (“Frontier Fixture”).